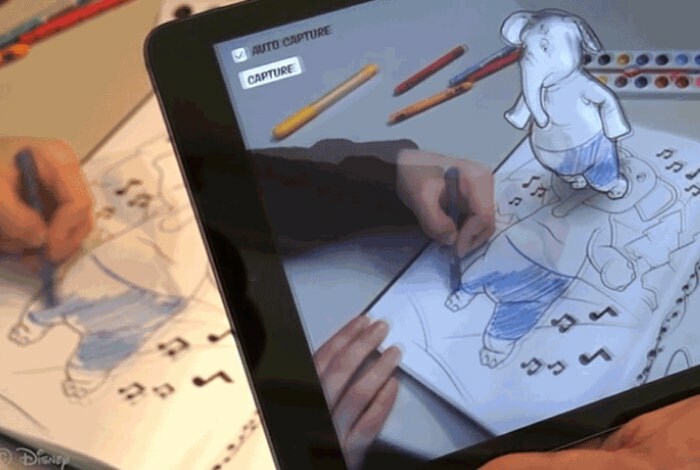 Disney has this week unveiled a new 3D colouring book concept that offers a way for users to colour-in augmented reality characters in real time. As you can see from the video below the prototype allows users to see the character they are working on in 2D, and also fully represented on the screen of a tablet or smartphone using the augmented reality companion application. Coloring books capture the imagination of children and provide them with one of their earliest opportunities for creative expression. However, given the proliferation and popularity of digital devices, real-world activities like coloring can seem unexciting, and children become less engaged in them. Augmented reality holds unique potential to impact this situation by providing a bridge between real-world activities and digital enhancements. In this paper, we present an augmented reality coloring book App in which children color characters in a printed coloring book and inspect their work using a mobile device. The drawing is detected and tracked, and the video stream is augmented with an animated 3-D version of the character that is textured according to the child’s coloring. This is possible thanks to several novel technical contributions. We present a texturing process that applies the captured texture from a 2-D colored drawing to both the visible and occluded regions of a 3-D character in real time. We develop a deformable surface tracking method designed for colored drawings that uses a new outlier rejection algorithm for real-time tracking and surface deformation recovery. We present a content creation pipeline to efficiently create the 2-D and 3-D content. And, finally, we validate our work with two user studies that examine the quality of our texturing algorithm and the overall App experience. For more details on the new 3D colouring book concept that uses augmented reality jump over to the official Disney Research website via the link below.